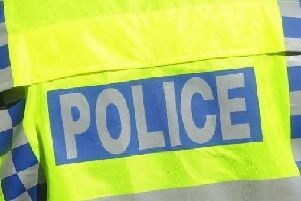 Police say they are now treating an incident at a pawnbrokers in Aylesbury, in which the windows of the shop were smashed, as criminal damage. Officers were called to Cash and Cheque Express in Buckingham Street at 9.40am on Friday July 22 to initial reports of an armed robbery. A man, armed with a sledgehammer smashed the windows of the shop before leaving in a vehicle, driven by a second suspect, without any property being taken. Police said this afternoon (Monday) that the incident is now being treated as criminal damage. The first offender is a white man, around 6ft tall or slightly shorter, of a medium to slim build and wearing white trainers, dark jogging bottoms, a dark top and a dark baseball cap. He had a bandana around his face. The second offender who remained in the vehicle is a white man wearing a black hooded top with the hood up. The vehicle being driven has been identified as a silver coloured Peugeot 206. Anyone with information should contact Det Con Chris Downs at Aylesbury CID on 101 or Crimestoppers anonymously on 0800 555 111.